A common criticism of the liturgy is that it is so easy to brainlessly go through the service without even thinking about what is coming out of one’s mouth. To that, I have to say — Yes. Absolutely. I completely agree. And I don’t have to go through a tirade to say that it is entirely possible to go through a relatively well-done contemporary service without thinking about what is being said or done as well. But that’s not what I want to debate. I don’t really want to debate at all. I simply believe the liturgy is a better way to “do” church. Here’s why. The key principle behind the liturgy is the concept of “The Divine Service.” That simply means “church,” right? No. The Divine Service is a description of what really goes on in church. We tend to think of worship as what we do for God. We haul our butts to church because it is our obligation to give Him praise. The Divine Service means something completely different. When we come to church, God comes to us and He feeds us. He feeds us with His Word. He feeds us with Holy Communion. He gives us what we need to nourish our soul and to help us get through another week of encountering the sinful world in which we are pilgrimaging (pilgriming? Spellcheck disagrees with both). Liturgy does this best because it isn’t my words…my stupid attempts to sound impressive; it isn’t some other schmo’s words, with or without a theological degree. If you’ve ever looked at the liturgy, just about every word said is from the Bible. The few that aren’t are generally from traditions established very soon after. And also, the words being used, the progression being followed are how the Church (capital C) has been worshiping God since ancient times and still does around the world in many different languages, every day. And yes. I can totally space off while doing it, and so can you. But there are ways to improve that, because one reason we grow bored is that we are doing it wrong. There are things that can make it so much better. 1. Memorize it. Seriously, if you’ve been doing it most of your life, it shouldn’t be all that hard. There may be little spots that you need to really work on, but you probably know a lot of it. The printing press is relatively young. That means that it was at least 1500 years before the liturgy was put into hymn books for everyone in the pew, and probably a few hundred more, but I am completely guessing. If you consider that elements of the Christian liturgy came from the Jewish liturgy, then considerably longer. Before whatever time it showed up in hymnals, the illiterate and literate alike knew it by heart. Notice that phrase — “by heart.” Memorizing something that you use frequently makes it your own. It frees up your eyes to gather in all that is around you and your brain no longer has to concentrate on taking those words on the page and sending them to your mouth. Your brain is actually more free to think about the beautiful words being said to the Lord. I stumbled upon this experience when I was pregnant with my first. I realized that, as a pastor’s wife, I would probably get more than my fair share of trying to hold a wriggly baby AND a hymnal, so I decided to memorize it. It made a HUGE difference in my ability to focus on what I was saying and what was being said. Because my eyes weren’t in a book, I could see that I was there in communion with the whole congregation as well as the whole Church (capital C) on earth and in heaven. Whoa. Most Christians who gripe about the liturgy are still big on Bible verse memorization. I had a friend who estimated that because she had about 3 or 4 liturgies memorized (i.e. Divine Service, Matins, Vespers), she probably knew over 750 Bible verses that she turned to quite frequently to bring her comfort. The Lutheran church in Russia credits their survival through the Communist era with the fact that they had the liturgy memorized. When the government took their Bibles and their hymnals, they still had the liturgy and could teach their children and grandchildren. 2. Study it. Almost every part of the liturgy has a specific purpose, it follows a pattern. The Lutheran Service Book, an exemplary hymnal, actually puts the Bible verses along side so you can look them up. We start with an invocation, because the only reason we can be there in God’s presence is because of our baptism, in the name of the Father, Son, and Holy Spirit. We claim our rights as sons to be in the court of the King, right there, with those words. Then, we confess our sins and receive absolution. Our sinfulness proclaimed, and our sins forgiven by God’s undershepherd. Only after our sins are removed from us can we rejoice with the Hymn of Praise (or Greater Gloria). Then, we hear God’s Word, we confess our faith in the Creed, and it all culminates in the Lord’s Supper. After that, we are dismissed to go into the World. Study the liturgy– the deeper you go, the richer it gets, and the more you know what is happening and why. God giving us the very words we use to encounter Him and praise Him. How can we do better? 3. Participate. What people dislike about the liturgy is that they don’t feel like they are participating in it. In a contemporary service, the songs are easier to sing. Because they are repetitive, we can start singing them without reading them, so that leaves that part of our brain free to feel and contemplate what is going on…wait a minute, this is sounding familiar. See #1. Particularly if you are not your average Lutheran trying to do a contemporary service, you are probably standing, maybe moving side to side, and you might even have one or two hands raised, either sending up your prayers to heaven, or in a posture to receive God’s gifts. You are more fully involved in the service. Liturgical people often refer to this type of worship as “entertainment driven.” I don’t think it is so much entertainment driven as much as participation driven. We want to be a part of it. If you are your average Lutheran going through a contemporary service, you are probably still sitting, still reading it from a page, and still not particularly absorbing what you are singing or saying. Most of the time, in liturgical worship, the pastor is gesturing to heaven, gesturing to you, praying, holding up his hands, etc. He knows the liturgy and he gets to do stuff. We are sitting there, holding our hymnals reading aloud words that aren’t ours that we aren’t thinking about. I admit — that’s a challenge for someone in our ADHD culture (which most definitely includes me). Since, as I said before, reading the liturgy aloud is relatively new, I would suggest it is difficult for most people. But I learned a lot from the High Church service. What is truly different about a really High Church service — the congregation has stuff to do, besides stuff that they read. As someone who used to attend a contemporary church long ago, what really hit me was that there are actions that the congregations does. I realized that I had missed my body being involved, and here, in the most surprising of places, I found a similarity. In Redeemer’s services, many choose to hold their hands in the “praying hands” position — this is so much harder than the fingers entwined posture or standing there with my hands in my pockets or holding my hymnal. The concentration on maintaining that position makes it so much more devotional. It also can’t be maintained with a hymnal in hand, so I had to listen and concentrate on the liturgy. I already knew it, thankfully, but anyone there would’ve been able to listen and learn. Whatever their bodies do affects their souls. 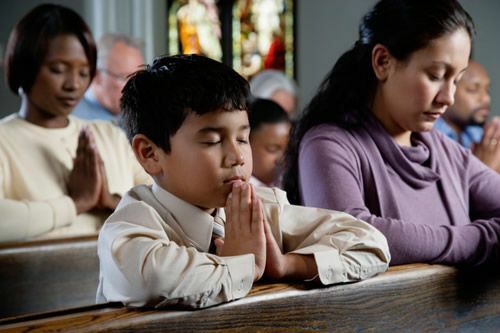 Other places where congregants participate in the service: When the pastor says “The Lord be with you” and extends his hands toward us, we also gesture toward him when we say “And with thy Spirit.” Also, we bow whenever we encounter mystery: any time the Gloria Patri is said (“In the name of the Father, the Son, and the Holy Spirit), when the incarnation is referred to in the Nicene Creed, and when the Words of Institution are proclaimed, (the Real Presence — Christ there — in, with, and under the bread and wine). There are many times that we cross ourselves (I like this article on that). All of a sudden, when I had stuff to do, I was so much more aware of what was going on in the liturgy at every single moment. These traditions are old. Most of the congregations that observe these practices do so based on a deep knowledge of liturgical practice history (and not everyone does all of this in the service, only some people choose to, because it is an issue of Christian freedom). Kyrie Eleison down the road that I must travel, Kyrie Eleison through the darkness in the night…. If the liturgy has lasted so long, if the Christian Church has seen fit to use it for thousands of years and only now, in the last 50 or so years are we saying that it is completely inadequate, then I think we need to look at ourselves rather than the liturgy. Sure we are sinners and not being able to pay attention shows that we are sinful. But we are doing it wrong, too. We are more passive than Christians have ever been since the days that it was proclaimed in Latin so the people couldn’t understand it. We are generally doing less than even going through the motions. Going through the motions actually helps. Become a true participant in the liturgy and see. Make it your own, not just words on a book. The liturgy has been handed down and added to throughout the generations and continues to be a living thing. That is so much better than any service that any one man, one worship committee, one praise band, or even one publishing house can put together. And then only one congregation is participating in that one service. Once. Ever.